The Learning Commons exists to support the school and prepare our students for college and a lifetime of learning by providing free and open access to a variety of credible print and digital resources, and thereby assist them as they grow intellectually, culturally, and ethically. The Learning Commons is a multidisciplinary literacy center, a space for research and instruction, and a center for technology and digital citizenship. To foster and facilitate the connection of ideas across disciplines and to explore knowledge outside of existing departmental silos, the Learning Commons will provide resources both to extend and support work in the classroom and to pursue individual interests and passions in privacy and safety. The design of the Learning Commons includes an open teaching area, a computer lab, and an area for research and collaborative group work. In addition, the Learning Commons is home to a hands-on tinker space for students, which includes our 3D printer and portable maker cart. The Learning Commons will help to shape our students to become critical and creative thinkers, discerning consumers and ethical agents of information, and increasingly active members in our vibrant and changing society. Juniors and seniors may obtain a card at Connecticut College's Shain Library which enables them to borrow print books from the college. The cards are free and are valid for one year. To obtain a Shain Library card, students must check in with Mrs. Le May to arrange a preliminary visit; their Williams Learning Commons accounts must be in good standing as well (no lost, missing, damaged, or grossly overdue books). Additionally, classroom teachers can arrange for special research and training sessions at the Shain library via Mrs. Le May. While many nonfiction and reference sources are now found via our online resources, we feel that the traditional book is still a well-organized and succinct information delivery system, particularly for students exploring a topic for the first time. We continually assess the collection for outdated books (particularly in the social, natural and applied sciences), and replace them with quality nonfiction titles that are directly tied to our curricula. In the glass-fronted Sandusky cabinets we have a collection of antique titles, most of which were published before 1920. The Williams Collection consists of books written by and/or about Williams School alumni and family. Access reading assignments and research materials for your history class, as well as for research projects. Access research materials for free. Print magazine and journal articles, e-book chapters, reference sources and more. To log in from home use your Connecticut public library card number OR -- click here, which will allow you to use your usual Williams School login info. This award-winning database presents information on more than 300 social and scientific issues. One of its most helpful features is its easy-to-use pro/con format. From the publisher: "Thousands of highly targeted documents, primary source documents, websites, and multimedia (including 13,000+ research-quality images) represent viewpoints from the pros and the cons, to everything in-between." (Note: you'll need the "alternate" password for home access). ResearchIT CT has collections of eBooks and documents arranged by grade level - here are direct links to the middle and high school collections. Search for eBook content available to use via our Gale holdings. 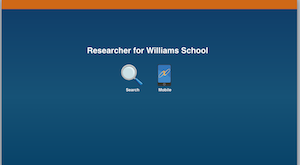 Need to search the Williams School Library for books? Click here to access our catalog, Alexandria. LibGuides is your central resource for starting your research journey. Your specific class assignment, along with recommended websites, books in the Williams School collection, links to NoodleTools and associated training videos -- everything you need to get started on an authoritative research project awaits you. NoodleTools is your tool for organizing your research materials. Write virtual note cards, create an outline, produce correctly formatted works cited, create To Do lists, etc. If you do not know the login and password for creating a new account, see the librarian or ask your teacher.